"I don’t know if this is living or just slimy," declares a young woman pawing through a mound of spiny, purple and green seaweed. She holds up a baby sea cucumber that is connected by a long strand of clear goo to the table. "Aaaaah, it’s like snot!" her friend observes. Both giggle. Tamar Cunha is laughing, too. "Just because they’re gross, doesn’t mean they’re not important," advises the University of Hawaiʻi at Mānoa zoology graduate student. "That’s what sea cucumbers do when they're freaked out." The student gingerly disconnects the slimy strand and plops the slug-like blob into a five-gallon bucket filled with seawater. It will be returned to the ocean along with crabs, snails, urchins and fish that are rescued from the clutches of the invasive gorilla ogo. 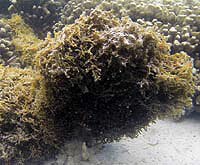 Known to scientists as Gracilaria salicornia, the focus of today’s cleanup is an algae, or seaweed, that poses one of the biggest threats to Hawaiʻi's coral reefs and near-shore marine ecosystems. It kills native species basically by smothering them, and it spreads very easily. Gorilla ogo has been regularly weeded from the ocean by a team of coordinators, scientific divers and community volunteers since 2002. The Young Leaders from ʻIolani and Punahou Schools help with the haul this day, collecting three tons of alien algae from waters immediately fronting the Hilton Hawaiian Village in Waikīkī. To date, the Aʻohe Limuʻē, No Alien Algae program has removed about 100 tons of the invasive plant. First introduced to Waikīkī and Kāneʻohe Bay for a short-lived aquaculture project in 1974 and later on Molokaʻi, gorilla ogo now accounts for nearly 100 percent of the bottom cover in infested areas. Like most limu, it does fine without roots, forming large, spiny clumps that roll back and forth with the movements of the ocean, abrading and smothering native sea grasses and corals. After large south swells, the beach at Waikīkī is often smothered too, under a heavy, pungent blanket of gorilla ogo. "The troughs where Gracilaria salicornia collects probably periodically empty with the south swell, and that means that stuff is moving horizontally along the beaches and spreading to other areas" through natural processes, says Celia Smith, professor of marine botany at UH Mānoa. Like seeds on muddy hiking boots, it can also snag a ride on boat anchors and propellers or even diving gear that is not carefully cleaned. It needs but a small segment to grow and clone; in fact, the entire population of gorilla ogo in Waikīkī is probably one clone. 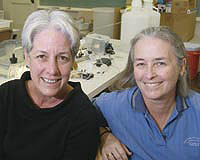 "There has been so much work in the last five years," says Cynthia Hunter, assistant professor of marine biology. "Statewide surveys, plot clearing, re-growth studies, comparisons, native species surveys—a lot of scientific research provides the ongoing context for the ogo removal." Still, much remains unknown about the long-term effectiveness of such cleanups and whether native plants and animals in the ocean can recover lost ground. Gorilla ogo dominates most Waikīkī reefs and overgrows reef-building coral in Kāneʻohe Bay, possibly causing irreversible damage to these unique ecosystems. The Hawaiʻi Coral Reef Initiative Research program estimates that the state loses millions of dollars each year in lost condo rentals and clean-up expenses. But things could be much worse. "If this creeps down to Hanauma Bay, it could destroy the reef," warns Priscilla Billig of the Hawaiian Invasive Species Council. Vigilant monitoring can protect Hanauma Bay, Molokini, the Kona coast and algae-free areas on Oʻahu's Windward side and North Shore, says Hunter. Back at the beach, divers sit on the bottom in 8–10 feet of murky water, filling large burlap bags with the abundant free-floating balls of algae in as little as 30 seconds. A free-diver or snorkeler brings empty sacks and swims the full ones to volunteers on body boards and long boards, who ferry the sacks to a small waiting zodiac. The cargo is zipped close to shore, where a Menehune line of volunteers moves each 20- to 30-pound sack to a large, wheeled cart bound for the sorting tables. Unlike its smaller, tastier Hawaiian cousin, limu manuea, gorilla ogo isn’t much to chew on, but there are other uses for the exotic pest. None of it goes into a landfill. First a local green waste recycling company turned the algae into composting tea, says Hunter. "Then some taro farmers started taking it to the taro plots for soil amendment and compost; they think it is tremendous. So by the end of the day, they have turned an alien seaweed, into poi!" Seeking to understand the interaction between the invasive algae and native seagrass, marine botanist Kimberly Peyton extracts a small fragment of the delicate marine grass, called limu enenue, from the carefully-measured samples she has collected at the site. "We’re tracking to see if the seagrass bed expands as the invasive species is removed," she explains. Green turtles graze extensive underwater meadows of seagrass like cows eating grass. They dig their flippers in the sand, turn their heads sideways and chomp down as the sand trickles out of the side of their mouths. Peyton will monitor changes in a seagrass meadow she identified in front of Duke Kahanamoku Beach. "The seagrass here forms only small patches that produce lots of flowers and fruits, which is what many plants do when they are stressed. Where there is no invasive algae, the seagrass spends most of its energy growing new leaves—the food for turtles and fish." The three-year-old algae removal program received a 2005 Coastal America Partnership Award and is widely touted as a successful model of cooperation of governmental, environmental, business and community groups. It maintains regular contact with more than 800 individuals, and hundreds turn up for regularly scheduled cleanups. "We’ve reached individuals age 4 to 84, including teachers, schoolchildren, parents, legislators—the governor has expressed her support," affirms Hunter. Outreach motivates community members to mobilize on behalf of their favorite beaches, collecting algae in Waikīkī or patrolling to make sure the alien stays out of unaffected areas. 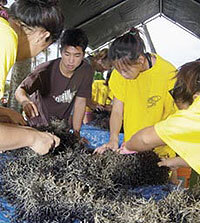 Tourists are drawn to the activity and small mountains of seaweed. Christy Martin, who represents the Coordinating Group on Alien Pest Species, is ready. She shows photos of the reef before and after infestation, explains the situation and records email addresses of potential volunteers. "The sorting table is also an opportunity for outreach and education. You can pull something out, hold it up and talk about it, and then listen," says Smith. "People have their own stories about limu. It’s not just us telling them, it’s them telling us, ʻMy grandma makes this this way.’ Hawaiian culture has paid much more attention to the ocean and its resources. I think that connection is part of what has people coming back to help over and over again." "Sometimes we hear, don’t you just think this is an impossible, Herculean task?" reflects Hunter. "Our answer is look, the problem has been going on for 30 years, we’ve been at it for three. We’ve learned a lot. We have made progress. It’s no time to give up, at all. This is something that can be turned around."